Senogles & Co, Chartered Accountants was first established in 1925 in Bangor, North Wales by Harold Senogles. The firm's focus was on accounts preparation and taxation advice to businesses and sole traders in the Isle of Anglesey (Ynys Môn) and Caernarfonshire region of North Wales. Steady progress was made in their offices in Arvonia Buildings, Bangor and the practice grew in terms of clients and staff. In 1948, on his return from active service in India and Palestine with the British Army, David Senogles joined the practice as an articled clerk. Gradually, David took over the running of the practice from his father Harold. A smooth handover passed the baton from father to son. In the early 1980s, Senogles & Co relocated from the mainland to Ynys Môn (Isle of Anglesey), into offices in Menai Bridge - right next to the Menai Suspension Bridge (below: a view from Ynys Môn of the suspension bridge over the Menai Straits with the Snowdonia mountain range behind). On the sudden death in 1985 of David Senogles, the family practice was sold to local accountants Cecil Williams Denton & Co; itself a very well established and respected firm in Bangor. During the early years of this transition, both Geoffrey and his sister Delyth worked in the firm - which now trades as Willams Denton. Geoffrey Senogles and his partners have revived the family firm - though now located in Nyon near Geneva, Switzerland. 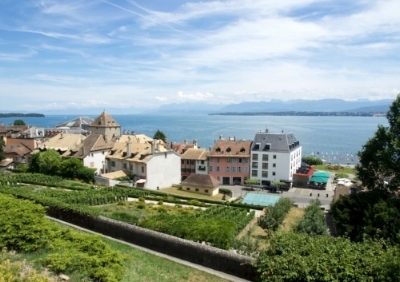 By choice we are still based near water, still in beautiful landscape, and still looking out over a mountain range (below: a view from Nyon across Lac Léman with the French Alps behind). Steve Brookfield and Geoff Senogles met in 1997 when working at Pannell Kerr Forster, chartered accountants in Liverpool, UK.